Yesterday I posted about the Huey P Long Bridge traffic switch. There was a contest to be the "First Over" the newly constructed lanes (see that post from yesterday) and also to be the "Last Over" the soon to be demolished 77 year old lanes. 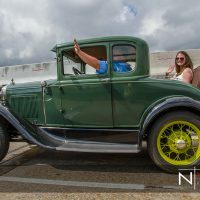 Thanks to an antique car club in New Orleans, the contest winner got to ride over old lanes in a 1931 Model A. Above: The media was in abundance for the historic event! Above: The last car over the old lanes! For more photos from the day visit and like my Facebook Page.